Neutral Modernization with a tint of Blue Decors for your Industrial Apartment you should give it a try. Walking into the interior of a 1 bedroom apartment brings about the boundless natural wood and cement flooring and backdrop. Drawing you in with a hint of solid blue finishing to pike your interest. Fully equip with a veranda, a study, a living space, a dining area, a kitchen, a bathroom, and a shower room. Combing you in with the matching wood tables and flooring to widen the natural exterior vibe. Ripping off a spacious and cooling ambiance to unite this bedroom. Separating itself from the other rooms for a quieter place to concentrate, whilst decorated with a grey-ish mellow palette to give off a calming mood. Widely use of cement and wood imports a laid-back, relaxed surroundings with an eye catching center piece; the blue couch. 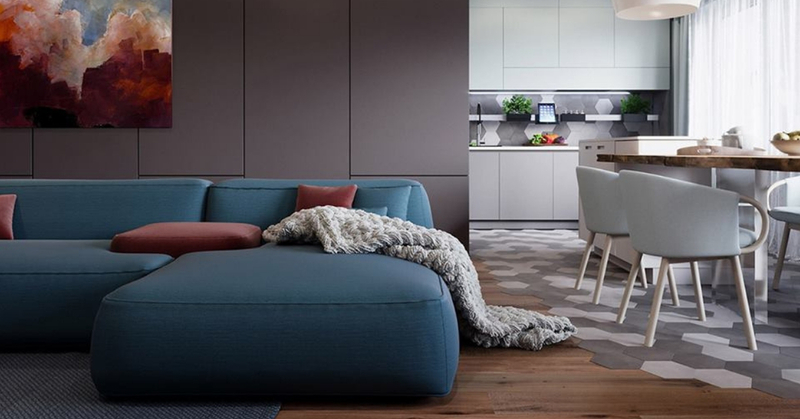 Spreading from the living area to the dining and extending to the kitchen, this connecting spaces operates to display a spotless image of debris free by the use of white and grey surround. An overall replica of apartment’s theme; the use if cement tiling and flooring, and wooden furnishing to depict a calm sensation when bathing.